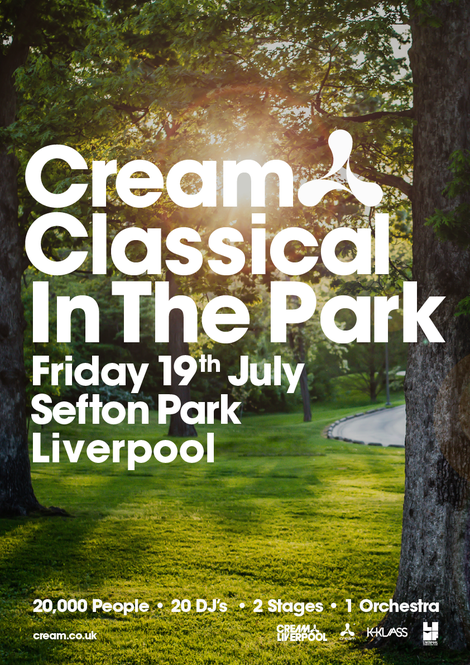 Following the success of the brand’s series of sell out Cream Classical shows at Liverpool Cathedral, Cream recently announced plans for an all-new 20,000 capacity festival in their spiritual home Liverpool - ‘Cream Classical In The Park’ on Friday 19 July 2019. The previous events brought together the 50 piece Kaleidoscope Orchestra to perform some of the club’s biggest tracks, and now Cream HQ are now aiming to take it to the next level for their biggest show to date, taking the ‘Cream Classical’ concept outdoors with the city’s Sefton Park as its setting. Bringing the orchestra, performers and vocalists together for a brand new show, ‘Cream Classical In The Park’ will also bring together 20 of the biggest DJs who have been part of the family over its 25 year reign, giving electronic music fans the chance to experience a night under the stars to celebrate the iconic soundtrack to a generation.